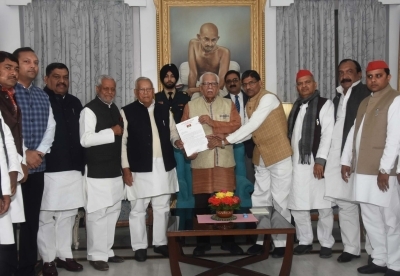 Lucknow, Feb 13 (IANS) A delegation of the Samajwadi Party (SP) and its ally Bahujan Samaj Party (BSP) met Uttar Pradesh Governor Ram Naik at the Raj Bhawan on Wednesday and submitted a memorandum against the grounding of SP chief Akhilesh Yadav at the Chaudhary Charan Singh International Airport here. The 15-member delegation, led by senior party leaders Ahmad Hasan and Rajendra Chowdhary, apprised the Governor of the development and registered their protest against what they termed was throttling of democratic and political rights. BSP supremo Mayawati has already castigated the Yogi Adityanath government over the action and called it a conspiracy to thwart their political movement across the state. Yadav was to take a private chartered flight to Prayagraj on Tuesday where he was to attend a students union event, which was disapproved by the Allahabad University officials. The former Chief Minister was asked by district officials of Lucknow to go back to his home as the Allahabad administration had apprehended law and order issues if the SP leader visited the campus. The incident had sparked protests across the state with SP workers disrupting traffic, taking to the roads and attacking government property.